Q. I am an owner in a very small older timeshare resort and am considering running for the board. The owners here are very suspicious of the board’s conduct. Our managers never seem to stay more than a year, while the board members have been in their positions for as long as we can remember. As I consider running for the board, I would like to know what ethical and legal standards apply to board conduct. A. You describe a situation on your board which could involve violations of ethical and legal standards. In fact, enough abuses of boards’ authority have occurred in other timeshares that some states—Florida in particular, have passed extensive legislation affecting everything they do. This includes requiring term limits for board members, and dictating bidding procedures for procuring goods and services. I recommend using a search engine to locate your state laws applicable to condominiums and timeshares. Both may apply because many older resorts were originally incorporated as condominiums. 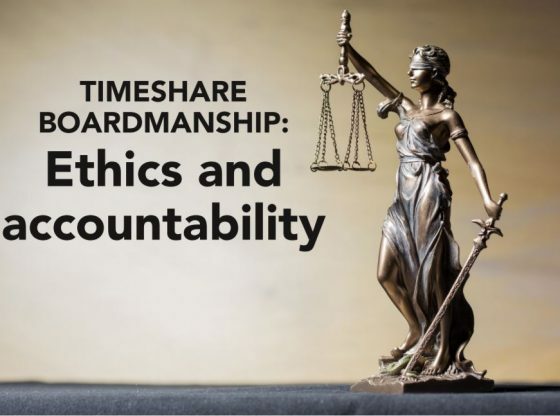 Some ethical standards for board members of timeshare boards are nationwide in applicability because of litigation and are part of case law. Most timeshares are set up as nonprofit corporations and the boards are subject to non-profit corporate law. Federal and state financial laws and regulations also apply to the conduct of timeshare business. A board member holds a position of trust and is entrusted with the property and well-being of the whole resort and homeowners’ association. This trust relationship is what is referred to as a board member’s “fiduciary duty” or “fiduciary responsibility.” A board member is a trusted representative of the membership. In his/her role, a board member is expected to act unfailingly in the best interests of the whole. This means subordinating his/her personal interests and the interests of all other parties to the interests of the whole. Often it means acting against one’s own perception of one’s personal best interests. For example, raising maintenance fees to cover increased costs and/or capital improvements may not suit one’s personal budget, but a board member is expected to take the action which serves the whole. Conflicts of interest are inevitable, and a board member must avoid acting where a conflict of interest exists. A board member must be alert to any situation where s/he stands to gain a special benefit from a decision, either financially or otherwise; where a member of one’s family would gain a special benefit from the decision; or where a company in which the board member has an interest would benefit. Board members must disclose their conflicts of interest and abstain from participating in the deliberations or voting on any issue where a conflict exists. Remember, too, that every member of an owners’ association comes to a board with a built-in conflict of interest because of his ownership in the property. The board member must manage that conflict according to the dictates of the duty of loyalty, which prescribes acting in the best interests of the whole. This conflict of interest, which all board members share, comes up in all policies and decisions affecting owners. and options, and carefully study that information before agreeing to an action. You must diligently guard against a “dominant” board member, chair, or manager pressing for agreement to a decision that is not fully supported by data you have seen or about which you have unanswered questions. legally expected to act in a prudent and reasonable manner using sound business judgment in every decision. budgets specify the board’s scope and limits of authority. Read them all and keep them handy for regular reference. The duty of obedience requires officers and directors to act in accordance with your governing documents, and to exercise authority knowledgeably. A board is a “group authority structure” that acts as a whole. The only authoritative decisions made by a board member are made in the context of formal board meetings and recorded as formal motions of the board. As an individual board member, you have no inherent individual authority that the board has not formally delegated to you. The board as a whole may delegate authority to a manager, usually in the management or employment contract, and assess the performance of the manager. As an individual board member, you may not “boss around” your manager, nor undermine the manager’s authority by bossing around resort staff. Discretion is important. Maintain appropriate confidentiality. Closed executive sessions of boards generally occur for just two reasons: meetings with the attorney of the board to discuss legal matters, or discussions with management of personnel matters. Strict confidentiality is required for legal matters to avoid adding to the board’s legal liabilities. Federal law requires confidentiality regarding personal information of employees. Board members also acquire sensitive information about owners’ lives and circumstances which should not be discussed beyond the board, nor should information about details of vendors’ bids be revealed to other vendors. Last years TMBA conference in Las Vegas. As a “group authority structure,” a board should speak with one voice about its work and decisions. The chair or president of the board is charged with being the spokesperson for the board, so other board members generally defer to the chair or president to publicize information about the board’s work and accomplishments. Individual board members who may have disagreed with and voted against a decision must respect and support the decisions made by a majority to avoid undermining the board during its term of office. During a period of campaigning for the board, individual board members running for office may ethically present their positions related to reform or change. Protect your reputation Avoid creating a perception of impropriety. People commonly believe that “where there’s smoke, there’s fire,” so any activity on the part of board members which is perceived as illegitimate can injure your and the board’s reputation. Many board members choose to avoid acts which may be legitimate but could be distorted by gossip. For example, if a board gives a contract to a relative of a board member, even if the board member absents himself from the discussion and recuses himself from voting, the rumor mill will grind. Always protect yourself by never accepting any gifts of value, particularly from bidding vendors. Also avoid seeking any preferential treatment from your resort in the handling of your fees or financial obligations, the assignment of priority to your rental weeks, the provision of service by staff, or in any other way not accorded to other members of the association. board chair. Your board may be well-meaning but ignorant of the breadth of its responsibilities, and it may have been unable to find competent and willing board members. Ask questions, and share your interest in running for the board. Timeshares and condominiums are mini-democratic governments responsive to political action. You may be able to make a difference. If you become convinced that the situation involves underhanded motives,ask the appropriate regulatory agency in your state to investigate and enforce its laws and regulations. As a last resort, you may file a lawsuit against your board. When a member of an owners’ association files such a suit, he is in effect suing himself, so this is truly a last resort. I wish you the best in your efforts to improve the governance of your resort. Lynne Kweder is an organization development consultant, a board certified coach, trainer of boards of directors and management, and administrator. Shespent seven years as board president of the Turtle Reef Condominiums I, Inc., Jensen Beach, FL.